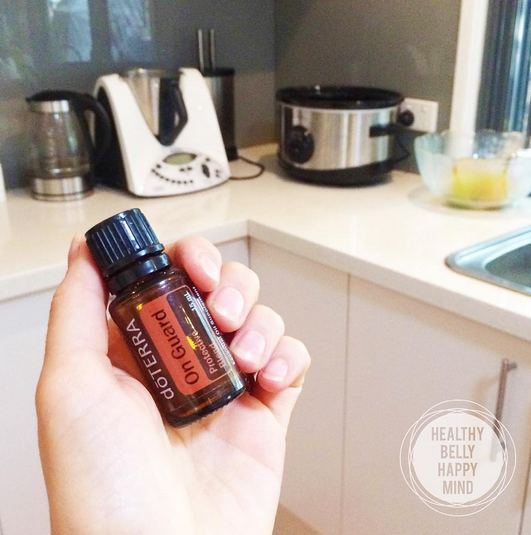 doTERRA’s OnGuard essential oil is a powerful blend that supports healthy immune function and contains cleansing properties. This is why OnGuard is a great essential oil to support your immune system this Winter and keep you well. There’s nothing better that being able to provide a natural and effective alternative for immune support for my family. OnGuard protects against environmental and seasonal threats and it can be taken internally on a daily basis to maintain healthy immune function or diffused to help purify the air. Here are the ways I like to use OnGuard to keep myself and my family well. Add two to three drops of OnGuard essential oil in a veggie capsule and take daily for an immune boost. Combine a few drops of doTERRA’s OnGuard with fractionated coconut oil (or your choice of carrier oil) for a natural hand cleanser. Add five to six drops of OnGuard essential oil into your diffuser to help purify the air and energising and uplifting properties. In a 10ml roller bottle, add two drops of OnGuard, one drop of Oregano, Lemon and Tea Tree, and top with fractionated coconut oil. Roll on feet and down the spine to support immune system with the season changes.